Doug Ford highlighted a transit spending pledge for his first announcement in the provincial election campaign. Doug Ford talked transit for his first announcement in the provincial election campaign Wednesday, pledging a new $5 billion for subways in Toronto and a general preference for underground transit. The Progressive Conservative leader also promised to upload responsibility to the province for the Toronto Transit Commission's subway infrastructure, but the city would still be responsible for day-to-day operations, as well as bus and streetcar lines, and would keep the revenue. "You know I want to build new subways and that means fixing the transportation mess," Ford said at a news conference in Toronto on Wednesday morning. He said a Tory government would also prioritize underground transit, which is reminiscent of the "subways, subways, subways" mantra of his late brother, former Toronto mayor Rob Ford. "World class cities need world class subway systems," Doug Ford said. Ford also committed to prioritize underground transit like the Sheppard Loop and the proposed extension of the Yonge Line. Outside of Toronto, Ford said he would support two-way, all-day GO Transit service to Niagara and Phase 2 of the Ottawa LRT, as well as regional transit projects in Mississauga, Brampton, Hamilton, London and Kitchener-Waterloo. Ford said he would build "a truly regional transit system," though he wasn't clear about how he would pay for the new initiatives. In a statement, Toronto Mayor John Tory said he welcomes Ford's "commitment to the Relief Line," though the statement made no mention of the other projects cited by Ford in his announcement. "The Relief Line is a key part of the City's transit network plan — a City Council endorsed plan that I have championed and will continue to champion," Tory added. 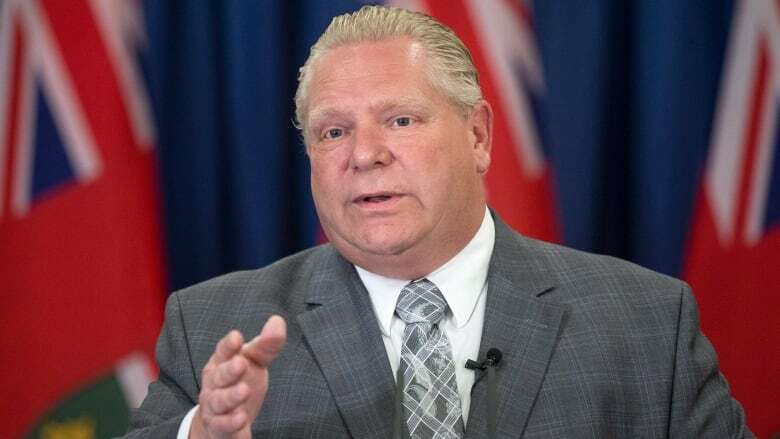 He also lauded Ford's promise of $5 billion additional dollars on top of some $9 billion already committed by the province and federal government for priority transit projects in the city. However, TTCriders, a coalition of unions that says it advocates on behalf of public transit users, argues Ford's plan will do little to cut down on the amount of time people spend on buses in traffic in parts of the city, like Etobicoke and Scarborough. "Instead of a handful of subway stops, we need cost effective new transit lines where they are needed the most and will serve the most riders," said Shelagh Pizey-Allen, executive director of TTCriders, in a statement. The organization has similarly been a vocal critic of any moves it suggests could lead to privatization of TTC assets. "Uploading the subways opens the door to privatizing parts of the TTC, which will result in less public accountability and potentially more expensive rides," said Pizey-Allen. The Liberals say Ford's commitment is still less than they would spend on transit, and the NDP said Ford couldn't be trusted on the file. "When he was a councillor and his brother was the mayor they increased the cost of transit for people," NDP leader Andrea Horwath. "They reduced by 10 per cent the transit budget. So for him to now say he's turned a page on the transit file, I'm not so sure people have much confidence in his commitment."